My research interests include the cultural and intellectual history of medieval Europe. I am particularly interested in patterns of literary representation across ethnic and religious frontiers. In other words, I examine what the image and representation of foreigners and foreign cultures can tell us about the culture that produced those representations. Until recently, I have been using pagan Lithuania as a case study to examine the complex discourse of inclusion and exclusion that developed between the peoples of Latin or Western Europe, Orthodox Russia, and pagan Lithuania in the Baltic region during the thirteenth and fourteenth centuries. I am now starting to extend my research both geographically and temporally. For example, much of what I have observed in the medieval Baltic is also true of the Mediterranean where the encounter between Christian and Islamic cultures led to remarkable cultural melding as well as the formulation of enduring cultural boundaries. A comparative study of cross-cultural perception and interaction in these two disparate geographic areas could be very enlightening. Also, many of the identity categories that we find in medieval Baltic texts, which I would argue are social and political constructs, still define cultural relations in the modern Baltic States. In my next work, I intend to explore the evolution of these ideas from their first appearance in the thirteenth century to today. I received my Ph.D. in medieval history from UCLA in 2015. 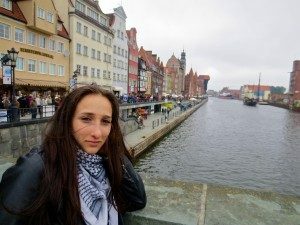 Between 2011 and 2013, I lived in Vilnius, Lithuania where I conducted my research with generous funding from the Fulbright Student Program and the American Council of Learned Societies Eastern European Studies Program. I have presented my research at conferences worldwide, including at the Baltic Studies Conference in Marburg, Germany and the German Historical Institute in Warsaw, Poland. Since completing my studies, I have began to pursue my second passion—teaching. My goal is to expose students not only to the fun of learning history but to show how the process of researching and sharing one’s findings helps us develop a versatile toolbox of skills and habits, including critical and creative thinking, communication and problem-solving abilities, and intellectual self-confidence. I am also currently co-organizing a conference entitled “Futures of History: Discussions, Displays, Demonstration.” It is intended to promote new ways of conceptualizing the discipline of history and the broad application of a historians skills and expertise in the public as well as private sector.